My First Lexus; 94 Ls400, Please Share Your Thoughts! just got it back from the shop across the street....not a lexus shop, but a mechanic i generally trust, only he wasnt there today, and his stand-in and I didn't have the same wave length...it felt like asking a Dr. who was in a big hurry what a corotid artery was. NEWS: It needs the lower oil pan gasket replaced ($20), and they also said that it needs a new halfshaft....the guy who looked at it said "it looks like it's been spraying fluid for a while now".....something they missed when I took it in the day after I bought it.....so I'm torn.....thinking about taking it to another place for another look..... The PS pump has a non essential plug just above the alt. If the pump is off it's easy to remove and plug. Otherwise, it's a PITA to get to, but can be done. Be sure to remove as much fluid as possible so it's below the Alt. I used a suction device which looks similar to a grease gun and sucked out the old fluid. Then, get under the car and there is a canister like piece on the driver's side of the rack assembly. Carefully remove it and clean out the screen inside. A good bit of fluid will come out of the rack. Now, fill the pump up with new fluid and while the car is running turn the steering wheel from lock to lock several times to get out all air. You can also fill the resivoir and leave the cap off overnight and a good bit od the air will escape. There are DIYS at http://www.lexls.com/ . I did these things and have no problems! Like I'm telling everyone, you cannot tell there is anything wrong with the car except for the brake light not lighting up in the back and the parking brake light randomly coming on.....it had lost 1/4 of a quart of oil over 600 city miles during summer in Vegas, so obviously the leak is small, but while I never noticed it being a constant drip, the mechanic who told me it was 1/4 quart low said it was a steady drip...... Guys, I'm torn here. I think a second opinion is in order, i'm thinking about trying to bribe a Lexus tech to give it a good once over, as I've said before, I want this car to last. Funny thing: I've always liked Lucas products. They work. They don't void warranties. I bought a bottle of oil stop leak that you use in combo w/ your oil and this place advised against it, but even more odd, was that they advised against what I thought might be a genius preventative maintenance idea- put a bottle of power steering stop leak (guaranteed to stop leaks) in my PS reservoir, and, voila, no issue with leaky power steering pump.....but this seems a little too simple..... (note: i have no leaky power steering right now....just trying to prevent it from when it apparently happens....but there's also about a 80% chance it already happened with the guy who put the 1st 155,000 miles on it) Oh and steve, TYVM!!!! I turned my CD's faceup (or down, w/e), and I had beautiful sweet music in my car again! Brother if you're ever in Las Vegas I'll buy you lunch! Also, what would be noticeable about the halfshaft when it was ready to giveout? It's only a $100 part, but I can't change it myself....probably cost me $200 in labor......I'm just not that mechanically inclined....nor do I think I have the tools....but I'm wondering about changing it, and whether it's something that you should wait until there's a noticeable difference in driveability before replacing.....I had a leaky rear end on my 07 tahoe when it was damn near brand new and put 30,000 more miles on it (mostly b/c I didn't think it needed to be addressed until I could sense some distress in the way it rode) Guys, HELP! Signed, Paranoid owner of a soon to be 170,000 mile car Bump for news: Took it in for a 2'nd opinion and this independent mechanic said that my lower oil pan gasket needed to be replaced. Okay, so both independent mechanics agree on this one. But this mechanic said that the entire half shaft didn't need to be replaced. He didn't go into great detail but he said "you could replace the halfshaft now, but since it's not even vibrating and the leak is so small it's not mandatory. Opinions, please. 1Maddog, my drain holes were completely stopped up when I bought my 93LS400. First I boiled water on the stove and slowly poured it in the front holes and they started draining. I did the same by elevating the front of the car and poured hot water in the channel since you can't see the drain holes. Then, I got some Clorox Cleanup and poured it in each hole/channel and flushed it out after a couple of minutes. Man, they drain like crazy! As for water in my trunk, I removed the upholstered side panels, located the clear drain hoses and replaced them with new ones about 2 " longer just to make sure they weren't leaking or overflowing into the trunk. I also flushed out those air/water vents on both sides above the small wells. Now, if I can only completely seal my tail lights. Tried silicone + new rubber washers around studs, but still a small leak! Thanks!!! That would be really appreciated. 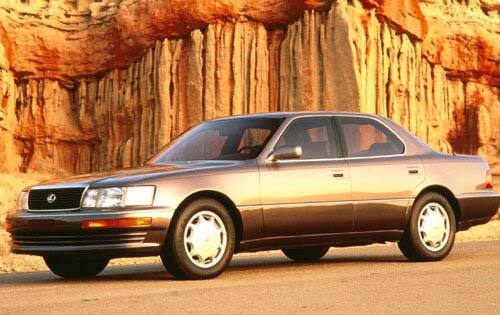 Does anyone have a schematic for the 1993-1994 LS400 CD changer? I'll see if I have a changer for you. Sounds like water damage, Can you confirm water damage ? Yes I think it was water damage from water buildup in trunk. I'm back after an extended absence, My 93 LS 400 had a trunk leak after hard rains and the CD changer won't work. My LED shows a "load" message and eventually an "ERR" message. The cartridge won't eject, but the door opens. Can anyone in the Club fix them or have any ideas? If dash instruments can be repaired, I don't know why changers can't be repaired from used or fabricated parts. I even would buy a new (used) changer if anyone has a good one. HELP, I have no music. My 93 LS400 leaks somewhere around the tail light area and mysteriously travels through the back panel below the trunk lid. There is a small wiring harness that runs across this panel. My leak is through what appears to be one of several tiny vents below this harness. I can see where it traveled to the wheel well and to the right side well below the changer. need to find the leak spot is around the tail light. I'm far from expert, but check your antenna. It should go all the way up on AM and it self adjusts on FM. I wish I could get my antenna to fully extend on FM, I have poor reception. Maybe you need to look for another radio, I haven't found a site to repair them or the CD changer. Check dcfish. A Mobil1 tech told me NOT to use their replacement fluid in my 93 ls400, 150,000 miles. He said if you use it at lower miles when nearly new it's ok. He suggested staying with oem to avoid the possibility of burning out clutches. That was my problem until I reinstalled these bolts on the CD changer and bracket! I can only think that it was a ground problem. A couple of bolts showed corrosion. I removed and replaced the bolts holding the CD changer and bracket and the reception got much better! I'm going to try cleaning up those areas that contact the body and then put dielectric grease on those points and the bolt threads to see if there could be a better connection. Thanks for all the replies! My PS is making a whining type of noise and checking posts, many people suggested flushing the fluid. I forgot to check which type of fluid and drained the resevoir about 6 times and added power steering fluis and Lucas PS conditioner. I've driven the car about 250 miles and plan to do a real flush today. How bad have I screwed up? I only put about two bottles of PS fluis in with the old fluid which was bright purple. Is this a Toyota color or does the color show problems? Help please!